Best known for dethroning Garry Kasparov, taking both his World Champion title and his number one rating for a time, Vladimir Kramnik has been one of the top players in the world ever since the 1990s began. 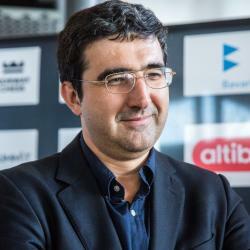 Repeating as World Champion from 2000-2007, Kramnik became one of the hardest players to beat in chess, using a style that focuses on positional play but also utilized strong preparation and tactical resources. Despite no longer being the World Champion, Kramnik will always be remembered for his incredibly strong play and being Kasparov’s kryptonite. Vladimir Kramnik learned to play chess at a young age and studied in the Soviet Chess School that Mikhail Botvinnik had set up. His first major success was when he won a gold medal as a reserve for the Russian team in the 1992 Olympiad. The next year he played well in another major tournament and defeated Vassily Ivanchuk who was the third best player in the world at the time. At the beginning of 1996, Kramnik became the number one rated player in the world, ahead of Garry Kasparov. He continued to be ranked number one for a short time, but this did interfere with Kasparov’s reign of almost 20 years being number one in the world. In 2000, Kramnik defeated Kasparov in the World Championship match, a big upset considering that Kasparov had held onto the World Championship title from 1985-2000. Kramnik held onto the World Champion title from 2000-2007 before losing it to Viswanathan Anand. Despite no longer being the World Champion, Kramnik is still rated among the world’s elite, consistently being ranked in the top 10.